Che miro? Il perfido nemico ambasciator!
. . . the result is a technical triumph. Clarity of sound? Superb. More importantly still for Bellini¿s bel canto opera of 1830, the temperatures of the performances are of the heat expected of a fully-staged production, not a night on a concert platform. As soon as the opening sinfonia begins under the baton of Fabio Luisi, the air bristles with expectation. So it should: this is the heart-tugging tale of Romeo and Juliet . . . They intertwine fascinatingly. In the trousered role of Romeo, Garanca easily projects virility and positions the notes, whatever their register, like a darts player hitting the bull¿s-eye. Netrebko¿s soprano is brighter and creamier . . . the lady¿s at her best where it matters most, inflecting her Act II aria Ah! non poss¿io partire with liquid anguish (appropriate enough: she¿s just taken that potion), and leaping like a greyhound through Bellini¿s wide-ranging decorations. Joined together in duets, the pair¿s voice colours make a perfect match, whether riding Act I¿s closing ensemble with their long-breathed cantilena or contemplating their joint tragedies in the Capulet vault at the opera¿s novel conclusion. We¿re told that the Vienna audience gave the couple a 15-minute ovation. I can see why . . . Luisi stirs the Wiener Symphoniker to excel: they exhibit warmth, exactness and some particularly graceful solo spins for horn, cello and clarinet. Joseph Calleja¿s darkly ardent singing as Tebaldo is so distinctive that you wish Giulietta¿s intended bridegroom had more to do . . . A good night at the opera. This newcomer . . . tops the list by showcasing the limpid beauty of the vocal writing . . . [Garanca]: her noble timbre and the exquisite way she negotiates Bellini's lines make this a performance to treasure. Netrebko turns Giulietta into a substantial personality. Joseph Calleja is the stylish Tebaldo, and the Vienna Symphony Orchestra plays sympathetically for Fabio Luisi. The result is an exciting, urgent, dramatic performance that seems to have benefited from having been recorded live rather than over-manipulated . . . the overall level of intensity and commitment from all concerned makes this the sort of set one wants to return to more than once . . . Netrebko is obviously a perfect fit as Giulietta and will surely be beautiful in the ROH production . . . the singing is always beautiful. She's at her finest in her romanza, 'Oh! quante volte', which is at once emotionally impassioned and vocally contained, but she also shines in the duets with Romeo, where her compatibility with Garanca creates an unmistakable chemistry. Garanca . . . seems ideally cast as Romeo. Her portrayal rivals the best of recent decades, thanks to the combination of her steely tone and a fearlessness in the delivery of the text. Garanca rises to the occasion in each of her appearances, be it her cavatina, the beautifully-constructed ensembles or in particular during the stirring duet with Tebaldo, one of the highlights of the set. Following on from an imaginatively-conceived album of bel canto arias released last month, this complete Capuleti finds Garanca riding the crest of a wave . . . The conducting of Fabio Luisi is perfect for this piece: he preserves the long lines which set Bellini apart from his contemporaries, yet maintains both the urgency and the lightness of touch which is needed to guide the bel canto repertoire. The sensitivity to the singers is remarkable . . . This fifteen-minute structure acts as one big accelerator into the interval, and by the end of it the Wiener Singakademie, orchestra and soloists are all at fever pitch -- which is just as it should be . . . this is a successful performance . . .
Star singers and star-crossed lovers -- a recipe for benchmark bel canto brilliance . . . There are times when her rich, velvety tones sound almost like a soprano, and in the duets with Anna Netrebko's Juliet, the two voices seem naturally to complement each other . . . Netrebko sings the beautiful lament "Oh! Quante volte" with considerable feeling . . .
Bellini¿s Romeo and Juliet opera (based on Shakespeare¿s Italian source rather than the Bard¿s reworking) has fared pretty well on disc. Here, the voices of the Russian soprano and the Latvian mezzo -- they are pictured as best buddies enjoying a giggle on the cover of the booklet, rather than as a doomed couple -- blend better, perhaps, than those of their counterparts on any of the previous commercial recordings, and . . . the beautiful sounds they make can be plausibly described as bel canto. Giulietta suits Netrebko¿s plangent manner . . . better than the more florid Bellini and Donizetti roles, and she is more feminine and touching than the icily brilliant Edita Gruberova or the brittle, virtuosic Beverly Sills. Garanca¿s warm, lustrous mezzo makes her ideal casting for Romeo, and the same goes for the supporting roles: Joseph Calleja¿s liquid-toned Tebaldo (Tybalt), Robert Gleadow¿s youthful but warmly sung Lorenzo (Friar Laurence) and Tiziano Bracci¿s sonorous, saturnine Capellio. Luisi, a more relaxed Bellinian than Riccardo Muti for Gruberova, is arguably the most idiomatic conductor of this beautiful, still underestimated opera on disc. A big success. Under Fabio Luisi's firm yet sensitive baton, Anna Netrebko's Giulietta and Elina Garanca's Romeo . . . prove a strong match . . . Garanca and Netrebko sing with impassioned commitment, relishing the sensuality of Bellini's long melodic lines . . . she shows impressive musical refinement and a sense of style -- one senses in the beautifully blended duets that Garanca's eloquence has put her on her mettle. This is ladies' night, but the Tebaldo of Maltese tenor Joseph Calleja offers sterling male support.
. . . an excellent complete set that has just been released, and they have obviously developed a great rapport. Both sing magnificently, effortlessly filling the house with a stream of perfectly pitched, impassioned singing. Fabio Luisi conducts the overtures as if it were challenging Rossini at his own game and Elina Garanca as his own Romeo in the last grand bel canto 'breeches' role is encouraged to out-sing any of the older maestro's cross-dressing heroes. Garanca is the best reason for cherishing this fine recording. There isn't a lyric mezzo-soprano who can currently hold a candle to the Latvian in this repertoire. Her cavatina 'Se Romeo t'uccise un figlio' has all the impetuousness of self-confident youth facing down carping middle age. Her idiomatic legato seems to revel in Bellini's melodic inventions. [Netrebko]: In their great Act I duet Garanca's Romeo finds a Juliet worthy of her gifts . . . There's no doubting the beauty or the power oh her voice . . . Robert Gleadow is a noble Lorenzo and Joseph Calleja a Tebaldo in the Juan Diego Flórez style. But it's Luisi and Garanca who put all recorded rivals to flight.
. . . the two principals could hardly be better matched. Yet there's not a weak link among the soloists here and it is unquestionably the sheer beauty of the singing that is most immediately striking. Thankfully, it is not of the empty-headed, attention-seeking variety aimed at the canary-fancier . . . Garanca inhabits every facet with conviction: lyrical and ardently persuasive with Giulietta, but forceful and heroic in challenging her family. Her dusky, creamy tone can weave a magically sustained line, phrasing supported seamlessly, with refined shading subtly illuminating every emotional nuance. Elsewhere, there's no lack of ringing urgency and incisiveness when required . . . [Giulietta] is amply reflected by Netrebko, who floats like a dream above the stave . . . Co-ordination is unanimous, delicacy tone and the intuitive way they listen to each other are totally entrancing, and their passionate engagement brings a rare satisfaction . . . Joseph Calleja offers a burnished contribution as Tebaldo . . . with plenty of open-voiced mettle, supple and particularly well balanced in ensemble, his negotiation of some of Bellini's trickier vocal manoeuvres is refreshingly deft and free-spirited. Both Tiziano Bracci and Robert Gleadow bring the requisite fire and commitment to their relatively minor roles as Capulet and the doctor. Fabio Luisi secures surprisingly lean and sinuous tone from the Vienna Symphony Orchestra. No extra Viennese calories here, but wonderfully alert, crisp playing, with some eloquent woodwind solos to accompany the singers. With a tight and full-bodied choral contribution, the big ensemble that closes the first act goes like the wind and generates terrific élan and excitement . . . It is a triumph for all concerned, with every expectation thrillingly exceeded.
. . . Luisi¿s conducting is overall so engaging, and the parts are well enough cast, that this recording of a lovely but light opera is certainly enjoyable. The hook here is the presence of Anna Netrebko as Giulietta, alongside Elina Garanca . . . as Romeo . . . the physical glamour extends to a hint of vocal resemblance; they each produce pretty shiny takes on long arcing lines . . . this recording, made last April during concert performances in Vienna, captures some of the limpidity and radiance she has at her best . . . [Calleja] has quite a beautiful voice: soft-grained, lyrical, and supple -- at its best . . . The other singers are perfectly fine -- Robert Gleadow notable as a youthful Lorenzo . . . Here is another terrific performance of this opera . . . for sheer beauty, it's unbeatable . . . An unbroken line of beauty at every register, with sincerity in her first aria, emotional sweetness in the duets with Giulietta, and stunning pathos in her final scene are invaluable assets . . . her Romeo is a successful undertaking . . . Giulietta fits Anna Netrebko like a glove. Seamless legato, a perfect sense of the character's melancholy, a stunning blend with Garanca, and an essentially youthful sound make her the Giulietta to beat . . . to hear her spin the long melody of "Ah, quante volte" is to experience bliss . . . Tenor Joseph Calleja's lyric-but-exciting sound is well used for Tebaldo; he rouses himself well for his opening aria and thrills with Garanca in their second-act duet. His delivery is wonderfully Italianate . . . Tiziano Bracci sings Capelio with a younger than usual tone, and the same can be said for Robert Gleadow's Lorenzo: they are both smallish parts, but they matter, and each has his heart in it. Fabio Luisi leads with a slow but sure hand . . . The Vienna forces play handsomely and the chorus gets properly worked up in the first scene and the finale to the first act . . . Garanca and Netrebko's combined singing is so beautiful that I must recommend this set . . .
Netrebko sings with apt feeling . . . [Garanca]: She does show a true mezzo coloration and the vocalism is largely fluid and correct. Garanca blends well with Netrebko . . . "Capuleti" is probably her best current serious bel canto vehicle. The part suits her Romantic temperament and luminously melancholy, dark timbre . . .
Mezzo-soprano Elina Garanca was a sensation at the Metropolitan Opera's spring simulcast of "La Cenerentola" with her vocal virtuosity, intensely blond glamour, and acting ability even in an opera that doesn't necessarily encourage much of that. These excellent recordings reveal a virtuosic sense that can feel chilly . . . In the Capuleti recording, she couldn't be in better company, with Anna Netrebko delivering some of most deeply felt bel canto singing of her career, tenor Joseph Calleja with his style and tone reminiscent of Jussi Bjorling, and the strong-minded conducting of Fabio Luisi. A satisfying account . . . which now leads the field. Die "Supermodels der Oper", Elina Garanca und Anna Netrebko, erfüllten als Romeo und Julia mit dramatischem Belcanto alle Erwartungen. Standing Ovations folgten. Was sie ohne Bühne an Passion zu bieten hatten, war tatsächlich hinreißend. Perfekt. Elina Garanca als Romeo im Hosenanzug: Eine perfekt geführte, jeder technischen Schwierigkeit gewachsene Stimme von extremer Expansion, verblüffend mit den Spitzentönen eines Soprans trotz ihrer Mezzo-Färbung, fast maskulin im Ausdruck und daher rollengerect. Anna Netrebko im Abendkleid: Eine Julia, die jede Emotion glaubhaft vermittelt dank ihrer Wahrhaftigkeit und Intensität. Ihr Lieben hat Überschwang, ihr Sterben ist herzzerreißend . . .
[Anna Netrebko] beeindruckte . . . als seriöse Künstlerin und sang die Julia in Hochform -- mit wunderbarem, samtig in der Tiefe gefärbten Timbre, schimmernd und seelenvoll, aber auch strahlend im Ausdruck mit sauberen Koloraturen und herrlichen Bögen. Garanca war ein farbenreicher, wunderschön phrasierender, aber auch jugendlich-ungestümer Romeo, bei der jede auch noch so kleine Nuance saß. Beide Stimmen harmonierten in den Duetten perfekt. Als Tebaldo war Joseph Calleja mit mühelosen Höhen und belkantesker Strahlkraft zu vernehmen . . . Sicher, ausbalanciert und homogen gestaltete die Wiener Singakademie. Herrliche Klangfarben boten unter der lebhaften Leitung von Fabio Luisi die Wiener Symphoniker, die in allen Instrumentengruppen mit vorzüglichen solistischen Leistungen brillierten. Mit noch einmal deutlich gesteigerter Stimmsicherheit . . . legte sie nun insbesondere im ersten Akt eine glanzvolle Interpretation der Giulietta vor, die in wunderbar innig ausgestalteten Bögen und mit wieder farbenreicheren und sicher platzierten Spitzentönen aufwartete. Ohne Zweifel liegen der Sängerin derzeit die lyrische, weit ausschwingenden Bellini-Kantilenen besonders in der Kehle und die verinnerlichte Interpretation erzeugte Momente großer emotionaler Kraft . . . Den entscheidenden Passagen wusste sie . . . stets den nötigen Glanz zu verleihen, sodass die Arien der Giulietta, die Duette mit Romeo und auch die großen Ensembleszenen ihre Wirkung nicht verfehlten und das traditionell zurückhaltende Londoner Publikum zu zunehmend früher in die Finaltakte hineinrauschenden Applaus animierten . . . Vom Publikum noch frenetischer bejubelt wurde die Interpretin der anderen Hauptpartie: Elina Garanca gab in ihrer markanten Erscheinung eine auch optisch ansprechende Darstellung des Romeo und überzeugte bei diesem szenischen Rollendebüt (nach konzertanten Darbietungen in Riga und Wien) auch stimmlich. Ihr Gesang zeichnete sich durch eine stets auf Linie gehaltene Phrasierung, saubere Intonation und akkurat gesetzte Koloratur in den . . . Cabalettas aus. Hinreißend gelangen so die stilsicher ausphrasierten lyrischen Passagen und vor allem der wunderbar schillernde Zusammenklang mit dem Sopran der Netrebko. Zwei der schönsten Frauen der Oper, beide immens erfolgreich, beide mit einer ganz eigenen Stimme gesegnet. 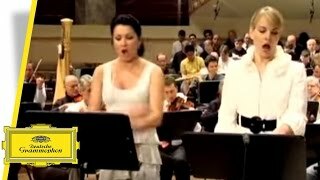 Wenn sich Anna Netrebko und Elina Garanca dem Belcanto widmen, dann kann man Bellinis "I Capuleti e i Montecchi" gefahrlos kaufen . . . Netrebko ist eine . . . Giulietta mit herzzerreißender Traurigkeit und Mut zum vollen Gefühlsrisiko. Elina Garanca in der Hosenrolle als Romeo bringt neben ihrem dunklen, betörenden Timbre auch jene Spur Edelmetall mit, die der Partie gut zu Gesicht steht. Zum einen ist sie [die neue Einspielung] den früheren Mitschnitten klangtechnisch überlegen, zum anderen sind Netrebko und Garanca Interpretinnen, die ihren Partien eine je eigene Prägung verleihen . . . Elina Garanca bietet jenes Feuer und jene viril anmutende Dezidiertheit, die das Experiment einer Besetzung mit Tenor unnötig machen. Man höre bloß "La tremenda ultrice spada" und achte auf die Energie, mit der die lettische Mezzosopranistin Töne von unerhörter Festigkeit produziert -- da vernimmt man die ganze Widerständigkeit eines Adoleszenten, wozu das Timbre nicht einmal künstlich abgedunkelt werden muss. In den Duetten mit Anna Netrebko erlebt man dann eine Harmonie der Tongebung und der Farben sondergleichen -- der dunkle Sopran der Netrebko passt ideal zum Organ der Garanca. Wissen sich die beiden Sängerinnen auch darin verbunden, wie sie ihre Stimmen stets ungehindert ausschwingen zu lassen vermögen, so überzeugt Anna Netrebko ebenfalls in den Soloszenen der Giulietta. Der warme lyrische Glanz ihres Singens, das hervorragende Legato, elegische Eintrübungen und -- besonders in "Ah, non poss'io partire" im zweiten Akt -- subtile, stets in die Linie eingebundene sprachliche Akzente vermitteln dramatische Empfindsamkeit. Ein Rollenbild also, welches über das der schönen Dulderin hinausgeht. Auch in der kleineren, undankbar schwierigen Rolle des Tebaldo wartet die Einspielung mit einer hervorragenden Besetzung auf. Joseph Calleja erklimmt seine Spitzentöne, ohne dass sich deswegen der sinnlich-weiche Schimmer, der seinem Tenor in der Mittellage eignet, verlieren würde. Von Calleja bekommt man mehr geboten als allein stilistische Kompetenz -- er punktet auch mit dem schieren Wohllaut seines Organs. Die Nebenrollen werden von Robert Gleadow (Lorenzo) und Tiziano Bracci (Capellio) tadellos gesungen. Der Dirigent Fabio Luisi animiert die Wiener Symphoniker zu einem flüssigen Musizieren, das sich durch federnde Rhythmik und sensitive Stimmungsmalerei gleichermaßen auszeichnet.
. . . wenn sich die Edelstimmen von Anna Netrebko mit ihrem hell timbrierten Julia-Sopran und Elena Garanca als grundierter Mezzo-Romeo verschmelzen, was in den vielen Duetten besonders heftig ausgelebt werden kann, dann sind Gänsehaut-Effekte garantiert. Dazu andere schöne junge Stimmen, die Wiener Symphoniker unter Fabio Luisi: Ein Belcanto- Fest.
. . . [eine] von Fabio Luisi spannungsvoll, dennoch flexibel dirigierte konzertante Wiener Aufführung . . . Die beiden Diven harmonieren hervorragend, im Duett "Ah, crudel, d'onor ragioni" klanglich dergestalt verschmelzend, dass sich der Reiz der Stimmen noch erhöht . . . [Netrebko stellt] ihre Rollenvorgängerinnen deutlich in den Schatten. Das klagende "Oh! Quante volte" wie auch die Szenen mit Lorenzo im zweiten Akt singt sie mit gut eingewirkten Verzierungen und sanft-elegischen Farben, das todessüchtige "Morte io non temo, lo sai" mit Morbidezza . . . [Garanca]: sie beglaubigt sowohl die Liebes- wie auch die Leidensglut des romantischen Jünglings. Berückend ihr sanft-seidiges Cantabile, das den narkotisierenden Melodien (etwa "Deh! Tu, bell'anima") einen unwiderstehlichen Zauber verleiht. Der vortreffliche Tenor Joseph Calleja als Tebaldo nutzt seine Arie aus dem ersten Akt ("E serbato a questo acciaro") für das Porträt eines rauflustigen Widersachers; voller Feuer die Auseinandersetzung Tebaldos mit Romeo im zweiten Akt . . . Luisi am Pult der Wiener Symphoniker vermeidet es, die Sänger in die Zwangsjacke von Taktstrichen zu sperren. Er gewährt ihnen, nicht auf Kosten der dramatischen Spannung, Raum für die Entfaltung der von Verdi bewunderten "melodie lunghe". Elina Garanca campe un Romeo au phrase délié et contrôlé, à la ligne de chant fluide et généreuse. Le timbre est opulent, chaleureux, soyeux -- ce jeune homme amoureux ne cache pas sa sensualité. Le "Se Romeo" du premier acte est négocie avec sincérité . . . le "Deh! Tu bell'anima" est d'une émouvante simplicité. On l'a constate a la Bastille: la Giulietta de Netrebko brule les planches tant est prenant le charisme de l'interprète. Ce rayonnement, que traduit à merveille le DVD, l'enregistrement audio ne l'attenue pas. Et de surcroit, le chant est, ici, plus soigne que d'ordinaire; on s'en rend compte dans un air d'entrée phrase a la corde, enrichi par un éventail de nuances raffinées. Le même souci de bien chanter et la même justesse d'expression se retrouvent dans des duos qui débordent de jeunesse et de tendresse. Joseph Calleja, en Tebaldo, se montre un digne partenaire . . . Robert Gleadow est un Lorenzo de belle stature . . .